Operation and Maintenance of any electronic products are as important as maintaining our house clean and tidy. Whenever we purchase any electronic products, may it be a water purifier or washing machine, O&M services is indeed needed. For instance, investing in a brand-new car stands in need of O&M service every three months for its enhancement and extended period. Similarly is the case when you invest and install a solar rooftop system for personal or commercial need. If you have been following SaveGeo closely, we have frequently shared information about solar power solutions. Before we get into depth, let us initially have a clear understanding of Solar Operations and Maintenance Plan. 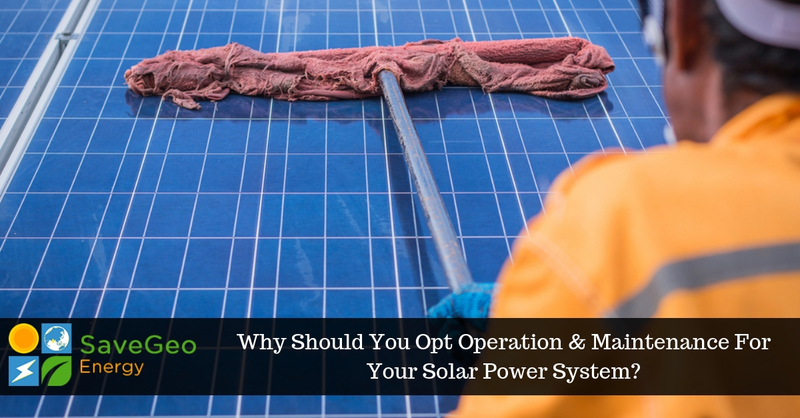 What is a Solar Operations and Maintenance Plan? Having installed a solar power system is not the end. It requires a routine operation and maintenance services, which helps in maximizing uptime and extend the life of the plant. Generated by each kilowatt-hour of production, the delivery of solar power without any disruption maintains the stream of economic value. Besides, while minimizing the risks of downtime to ensure optimal performance, proper service consists of a critical component. If a solar installation is well taken care of its actual performance increase to 10-30% in comparison to other installed solar power system that is not well-preserved. Over and above, system components could be void of all warranties deprived of proper operation and maintenance. We all know what solar energy brings with it and life after installing the solar rooftop system. Moreover, a necessary minimum routine maintenance is indeed needed for solar plants to function to their optimum generation capacity. As a result, it seizes a precise amount of time to organize and clean things every other day. To ensure a prolonged life and good generation, hire an operation and maintenance service provider who will maintain your solar panel system and inhibit it shining at a nominal charge. Not only this, you get high returns from your plant if you acquire a well-credentialed solar O&M partner. A consummate pro would be able to sense if there is something wrong with the system and raise the flag. While a typical consumer may be able to do basic cleaning himself, unless he has a sound technical understanding, preventive maintenance is not something he would be capable to offer. So, when you go ahead and choose SaveGeo as your solar photovoltaic operations & maintenance service partner, it offers a wide range of services based on your plant’s sourcing strategy, infrastructure and degree of expertise in the solar energy spectrum. Our team of experts operate and maintain solar power systems by providing a time-to-time report on solar power generation. Also, possessing expertise in project commissioning along with devising mechanisms to retrieve and manage solar power generation data to enhance our O & M services. On-grid solar systems are connected to the utility grid, typically the public electricity grid. With SaveGeo’s efficient and systematic approach, we provide on-grid solutions for both commercial and residential consumers. We assess our clients’ requirements with a detailed feasibility analysis to suggest the most effective relevant solution. Our expert engineers study the design and structure of your location to provide the best in class equipment. After installing your on-grid system, we regularly perform the long-term O & M activities. Our solutions are highly scalable enabling our clients to reap maximum benefits from their investment in the on-grid system.